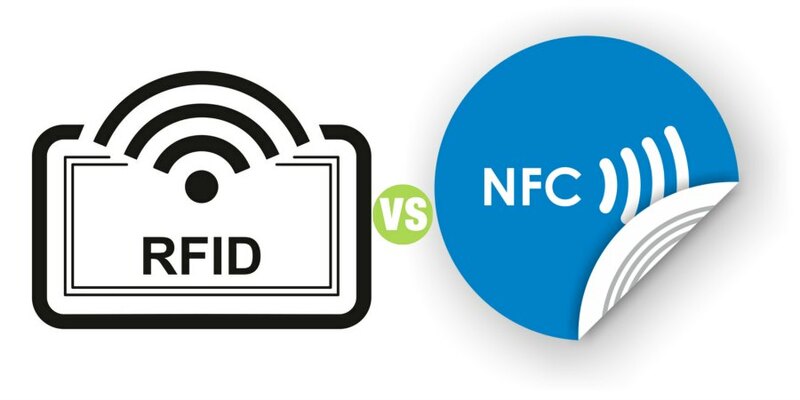 Summary: Difference Between RFID and NFC is that RFID is a standard, specifically a protocol, that defines how a network uses radio signals to communicate with a tag placed in or attached to an object, an animal, or a person. While NFC stands for near field communication. It is a communication protocol that enables two electronic devices in close proximity to interact with each other. One of the two devices is portable device like smartphone. RFID (radio frequency identification) is a standard, specifically a protocol, that defines how a network uses radio signals to communicate with a tag placed in or attached to an object, an animal, or a person. The tag consists of an antenna and a memory chip that contains the information to be transmitted via radio waves. Through an antenna, an RFID reader reads the radio signals and transfers the information to a computer or computing device. Readers can be handheld or embedded in an object such as a doorway or tollbooth. NFC stands for near field communication. It is a communication protocol that enables two electronic devices in close proximity to interact with each other. One of the two devices is portable device like smartphone. One device transmits the signal while other receives the signal. Waves involved in data transmission are radio waves. It provides wireless connection between two devices only within radius of 4cm. It enables these two electronic devices to send and receive information.NFC does not cost anything as it does not require 3G, 4G or Wi-Fi. NFC is used for sharing images, video clips, files, apps, for sending directions or sending contact information. NFC has made mobile payment possible through contactless payment systems. NFC enabled devices act as keycards. Active NFC devices can both send and receive information. Active devices not only interact with each other but they also interact with passive devices. Examples include smartphones, card readers and touch payment terminals. Passive NFC devices cannot connect to other passive devices. They don’t process data sent by other devices. These devices also don’t require their own power source. Examples are tags and transmitters.